This past Thursday I had the pleasure of experiencing Punk Black's showcase at Union in East Atlanta Village. The exhibition features alternative black rock culture at its finest and displays an accurate cross-section of Atlanta's more niche happenings. Punk Black was formed by the members of Atlanta rock band Howling Star and creative mind Kharis Ellison in May of 2015 at the closed house venue House of Lotus. 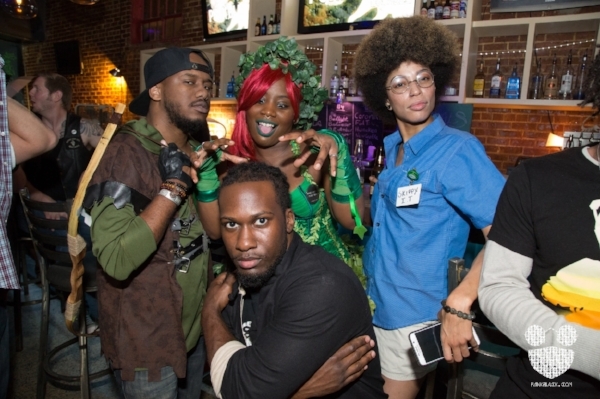 The founding members consist of Jamee Cornelia (Host), Arkkade Kult (Creative Manager and DJ), Von Phoenix (Creative Director, Booking, and Event Coordination) and Kharis Ellison (Cosplay Media Director and Creative Manager). Initially, Punk Black was the product of a campaign to garner votes for a Battle of The Bands competition sponsored by the Atlanta segment of the AfroPunk Festival. After encountering an overwhelmingly positive response to their events, the members decided to make Punk Black a regularly occurring event at Union in East Atlanta Village. Atlanta’s population of people of color that love and support rock music utilized their voices to show support of Punk Back, and that outcry was deafening. Punk Black has become a place of solace or a haven for people of color to indulge in their passions. Punk Black aims to solidify a spot for people of color in the genre of rock music respectively. With the rapid pace of change in today’s music scene, genres seem to come and go at a moment's notice. People of color have always been members of the various countercultural movements that have unified and polarized the American culture. Although black membership is evident, black contributions are many times muted in the overall scheme of things. Punk Black is contributing to the culture in a way that one can not overlook or in a modern sense, scroll past. From booking bands to the sharing of ideas and voices, Punk Black is creating a movement in the midst of the Atlanta underground music scene. The value of this kind of culture push is something of grave importance. The need to display black culture on a broad spectrum is often overlooked. The folks at Punk Black know that black people have varying interests and cultural signifiers that deserve platforms and equal representation. Through their events and literary efforts, this segment of black experience seems to be in great hands. Punk Black has an upcoming show on July 21 at 368 Ponce. Be sure to come out for some great music amongst great people and prepare to mosh. You can find more from Punk Black on their website here.